Shop our TeePublic Store and discover great merchandise like t-shirts, hoodies, phone cases, stickers, and more. A purchase from this store will also mean you are helping parrot rescue organizations. Check it out and thanks! To see more of me on YouTube, visit my YouTube Channel! I’m Einstein! The Talking Texan Parrot! I’m a Congo African Grey Parrot, hatched on June 15, 1997. I was hatched in Garland Texas, a place called "Joanna's Nest Box." That was a long time ago and Joanna no longer raises parrots. I became a parrot companion to Marcia and Jeff in September of 1997. They are my "flock". I think of them as just a couple of big birds without feathers! They provide me with everything I need, and everything a parrot could want in a domestic environment. This website is designed to inform you about the care of parrots and also entertain you. Living with a parrot is a big commitment. Parrots live a very long time; we require much care, proper nutrition and training. Time and patience are required by a parrot caretaker. Parrots need a lot of attention and lots of toys and activities to keep from being bored. Parrots are also expensive. It is often said, "Having a parrot is much like raising a 2 or 3 year old child for the rest of your life!" This website demonstrates just a fraction of what is required to raise and keep a parrot. In November of 2014 I became famous when my impersonation of Matthew McConaughey went viral! Many of my other videos have become very popular and you can watch them all on YouTube. Sometimes people confuse me with another parrot that appeared on a TV show called Animal Planet in 2006. We do share the same name, good looks, and the desire to entertain humans! He is very talented and performs daily shows at the Knoxville, Tennessee Zoo. Read my blog post, The Name Game to learn more! Marcia built my first website in 2004 as a way to share all the videos she, and Jeff had recorded of me and to connect with other parrot owners. It was in 2007 when I made my debut on YouTube. Since then, I have become very social! Marcia is my social media director. Einstein Parrot can be found on Facebook, Twitter, Google+, Pinterest, and I write Einstein's Blog too. I do my best to write interesting stories about my life and antics. However, my typing is very slow… I only use my beak to peck all the keys and operating the mouse with a foot that only has 4 toes can be tricky! Enjoy looking around the website. 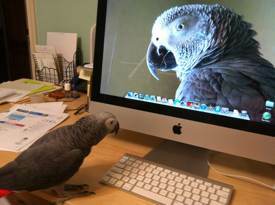 Go to YouTube Fame page to watch some of my videos and read stores about me and information about parrot care. I hope it is both educational and entertaining! My Vocabulary page is where I have listed most of the words I can say. My Photo page is an album of pictures. The Celebrity page where I share the exciting projects I have been involved with. Finally, my Frequently Asked Questions page (FAQ) is where you will find answers to many questions you might have about me. Parrots need lots of healthy, nutritious food! The section Chef Einstein, is dedicated to wholesome recipes that are prepared and frozen. You'll also read about, and watch videos of Einstein in his kitchen drawer, the famous kitchen rug, food vocabulary, and "helping" in the kitchen. I share all my FREE recipes! More information about parrot nutrition and a list of foods is shared on my "Eat Your Corn" page. Finally, I share some of my favorite websites in the Links area. Einstein Parrot is an entertaining and famous talking African Grey Parrot living in Texas with his family. Watch videos of his amazing speech and his hilarious antics! Information about parrot care, training, and feeding included. Purpose: To entertain and bring joy, to foster the human-parrot bond, and to convey that parrots are deserving of immeasurable amounts of patience, nurturing, and companionship.